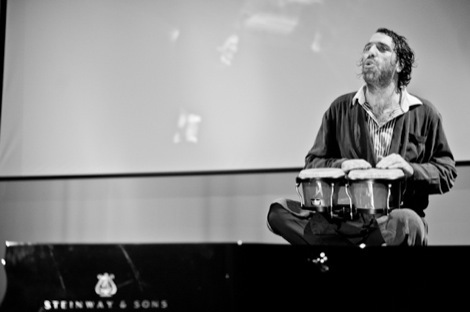 Unstoppable, a one-off and a sure-fire contender for gig of the year, Getintothis’ Orla Foster is on her feet not once but twice to salute the maverick talents of Chilly Gonzales. 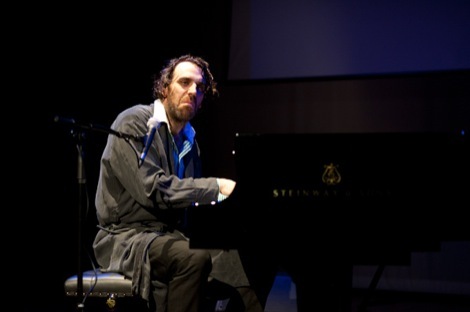 If, like me, you’re pretty new to Chilly Gonzales, there are a couple of things you should know. 1. 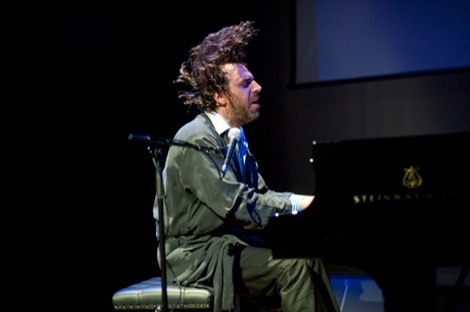 He holds the Guinness World Record for the longest solo piano concert. Twenty-seven hours, three minutes and forty-four seconds. 2. I have to be up in the morning. I don’t have twenty-seven hours, three minutes and forty-four seconds to lose. Still, I make my cautious way to Liverpool Hope’s Capstone Theatre – a respectable new campus venue slightly outside of the city centre – unsure of what to expect from tonight’s Evol showcase, but hoping there’ll be lashings of piano-fuelled fun and badinage. And it’s a pretty unconventional evening from the start. First up is a screening of ‘ Ivory Tower‘, Chilly’s oddball feature flick about two sparring brothers caught up in the chess tournament to end all chess tournaments. The film, which relies on halting, pun-heavy dialogue and cheerful picaresques, is easy to like in a Napoleon Dynamite sort of way, and there’s plenty of howling in the aisles to greet every chess-related play on words. The slogan “Chess You Can” has guffaws ringing out from every seat, for some reason, while Canadian DJ/producer Tiga steals the show as Chilly’s self-seeking, ultra-groomed younger sibling. After this there’s a brief interval before Chilly takes to the stage. He starts off with the serious instrumental stuff, the prodigiously accomplished nature of his performance fitting quite well with the austere NO EATING/DRINKING warning inscribed on the plaque outside. And he’s good. 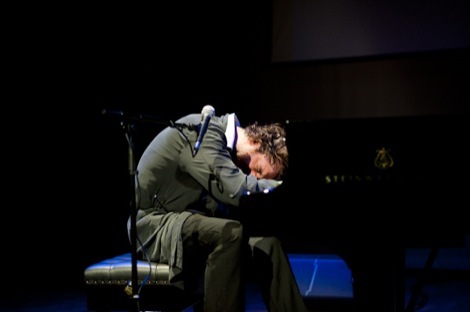 Make no mistake, the man knows what a piano is. In his trademark dressing gown and slippers gig attire, there’s a note of casual ease as though he just nipped downstairs for a glass of water, dropping by the stage in passing on his way to the kitchen. It’s a virtuoso display, a little bit scary even in its dressed-down state – like walking in on Rachmaninov in his nightie. But after thundering away on the ivories a little while, sometimes softly, sometimes with mallets for fists, Chilly begins to address the audience as if they’re old friends. There are forays into shrewd, playful rap, there’s stand-up worthy of Larry David, there’s a feast of anecdotes. Everyone is in stitches as Chilly recounts the tale of his father moving into fellow-Canadian rapper Drake‘s apartment block, and the lucky twist of fate that “Gonzo” rhymes with both “Toronto” and “dad’s new condo”. A couple of spirited renditions of Chariots Of Fire, which Chilly has elected as Liverpool’s theme tune for the night, and some ‘Happy Birthday’ in a minor key – ‘the sound of the supervillain‘, he insists – and everybody’s in a thoroughly jovial mood, wondering what he’ll come up with next. There’s also an entertaining interlude in which the now instantly recognisable sound-bite from the Apple advert is looped onto a compliant iPad so Chilly can poke fun at how repetitive it is and wryly observe that even the patronage of Apple can’t catapult him into the major league. Finally to round things off, there’s a delirious, off-the-wall medley, showcasing his second-to-none musicianship and ability to mix genres as effortlessly as most people exhale. The crowd are maybe a little starched, laughing pointedly and uproariously to show they recognise the melodies being gradually woven into Chilly’s tapestry of noise – Hotel California segues into FÃŒr Elise, Champagne Supernova, Still D.R.E. and The Power Of Love, but you can’t knock it, everyone’s thoroughly entertained, Chilly’s obvious talent as pianist and unstoppable energy putting ordinary humans to shame. For his final bow Chilly nestles on top of the grand piano with a pair of bongoes in a sequence that feels delightfully improvised, as though he could come plummeting through the soundboard any second. 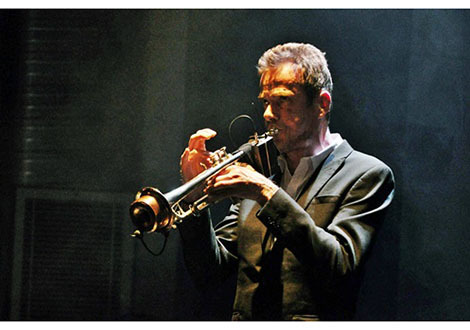 Even without a microphone he’s the embodiment of brassy self-confidence, his playfully laconic delivery booming through the lecture theatre as he whacks out some percussion and fizzles with excitement. By this point you half expect the audience to be shrieking ‘Bravo‘ and tossing carnations onto the stage, and they aren’t far off. There’s a lot of genteel humming and stoppy-starty finger-snapping to make you wince, but fortunately Chilly is having none of it and begs them to stop. He exits the stage to a stampede of people leaping to their feet and applauding as if their lives depended on it. 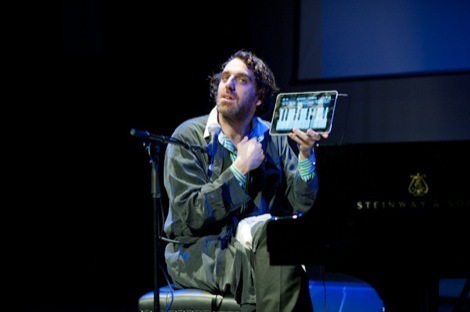 Precocious, unpredictable and very funny, Chilly Gonzales is a real one-off. I’ll need a little practice before I can hack the full twenty-seven hours, but tonight set me on track. Photographs courtesy of Mark McNulty.